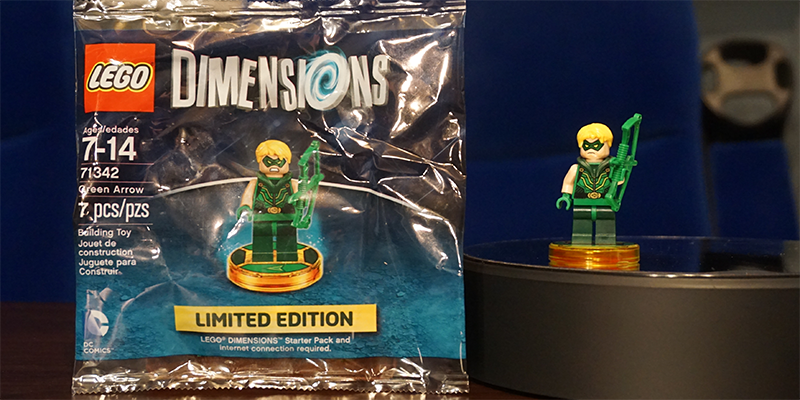 The mystery of the LEGO Dimensions Green Arrow minifigure/polybag was (partially) solved last week, when it was given out to people who attended the E3 booth in Los Angeles. Partially surprising, the LEGO Dimensions team did confirm that it will indeed be exclusive to events, but not just to E3. So expect to see this limited edition LEGO Dimensions figure available at other events across the globe in 2016 (Places like Comic Con, Gamescom, perhaps even a PAX or two?). If you can’t make it out to an event LEGO Dimensions did tease to stay tuned to their social media channels, as they will be giving out some there as well. But if you just can’t wait, I have you covered here. I was able to pick up an extra one at E3 and giving it away to one of you! Simply head to the giveaway widget at the bottom of the page or you can always head directly to the giveaway page. If you are on mobile, you may see a giant blue “Enter Competition” button as well. So again, good luck to those who enter to win the LEGO Dimensions #71342 Green Arrow figure. I included more methods of entry than I ever have before. Hoping to keep it fair for those of you who don’t have social media account. As always, be sure to come back each day as there are ways to earn more entries by coming back each day!